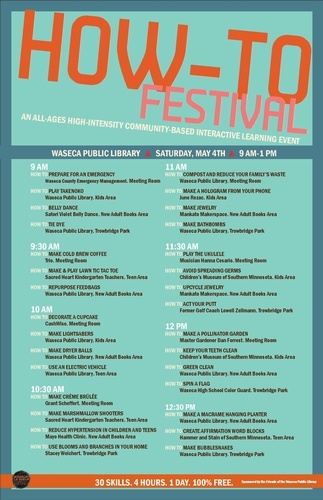 Learn a wide variety of skills at this community-based interactive learning event on Saturday, May 4th from 9 am-1 pm at Waseca Public Library. From making music, to making a craft, to making a meal, add a few tricks up your sleeve in these 30-minute sessions. Sessions are led by local businesses, library staff, and community members. All ages are welcome at this event, which celebrates lifelong learning. Staged at various locations in and outside the library, multiple sessions will take place at the same time. Stop by Waseca Public Library for a schedule. Free and open to the public. This event is sponsored by the Friends of the Waseca Public Library.